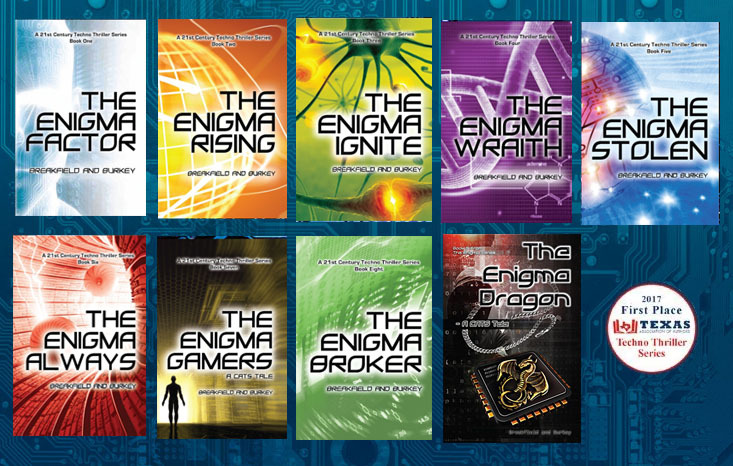 The Enigma Series is an amazing nine book series and a saga of sorts about cyber-crime. It’s a very timely subject in view of what is going on in the world today. Another incredible feature about this work it’s that is authored by Charles V. Breakfield and Roxanne E Burkey. Both authors are well-traveled and have progressive lifestyles. I think you will find our recent conversation an insightful experience. Warlock Asylum: Please share with us how you two authors came together to produce such a fine work? Breakfield and Burkey: Breakfield and Burkey have worked together at a couple of different organizations, in roles focused on technology. They worked on technical documentation for those companies and found they liked writing together. Together they created two non-fictional books which by today’s standards of technology evolution where close to old when they were produced. Burkey suggested they have a bit more fun and take the fictional approach leveraging their rich technology expertise. Warlock Asylum: How did the initial idea of doing a series about cyber-crime come about? Breakfield and Burkey: It really began due to the disappointment in doing non-fictional books outdated shortly after they hit print. Because of our experience in the technology field, coupled with our travel and professional interactions we were able to read the signs of what was possible and actually happening. We decided we could be far more influential with fictional stories based on relevant facts for today’s adults. We found when we dropped the text book approach and tell a good story, the knowledge transfers to the reader better. Warlock Asylum: What sort of research was involved in the development of the storyline, if any? Breakfield and Burkey: Our day jobs in technology require we stay abreast of the current directions technology is taking. We research each story and make informed calls about those directions, then weave them into relevant stories, each on focused on a main subject that leverages well-baked characters. For example, The Enigma Ignite is centered on drones and satellite technology, The Enigma Gamers on Gamification, and The Enigma Broker on covertly modifying the commodities markets. Each story has a main point for reader consideration. We find it so very gratifying when we read about one of our storyline threads coming to fruition. Warlock Asylum: What are some of the things that you have learned about cyber-crime since writing the Enigma Series? Warlock Asylum: How has the Enigma Series developed your skills as writers? Breakfield and Burkey: Of course. It is like any other skill, the more you apply your talents the more it improves. Though each story is important to us, like children, every subsequent story is written better with more adapted advance technology. We love being storytellers in writing or when we do speaking engagements. Warlock Asylum: What obstacles did you have to overcome in order to make writing a priority in your life? Breakfield and Burkey: We each have day jobs. To write, we each set aside time every day to contribute to a story, research, and/or think up new angles for the current story. In the long run, it is a craft we wish to improve upon and make our main work focus. Warlock Asylum: Can you describe some of the feedback that you have received since the release of the Enigma Series? Breakfield and Burkey: We have received a variety of reviews and comments. We have comments that people hope the books will become a movie or a TV series, others that love the characters, and still others that enjoy how we weave such interesting stories. Of course, like many who think the anonymity of the Internet allows rudeness, we have those that want to knock the stories for being unrealistic. Since we have lived the technology evolution wave we have a great basis for the facts we embed in the stories. Some folks simply don’t have our broad-based experience, and like many, if they do not understand it they try to make it irrelevant. We might suggest they need a broader frame of reference. Warlock Asylum: What can we expect to hear from Breakfield & Burkey in the near future? Any final thoughts? Breakfield and Burkey: Breakfield and Burkey continue to bring out the stories in audible formats. The first 4 stories have been brought into the audible, audible UK, and iTunes markets with stellar narration. We have 3 new short stories in as many genres entered into contests for 2018. We are also working on book 10 of the series, working title The Enigma Source, which we hope will be in the market in summer of 2018. We love telling stories and creating new ideas from the technology we know. *Thanks for sharing such a rich experience about the lessons of your craft as writers. Personally, I’ve found our dialogue to be a great source of encouragement for myself as a writer. I am sure that many of our readers will find your insights beneficial as well. Wishing you all the best! Good luck for the authors with book number 10!